The Best Books Ever: Win a $15 dollar Giftcard to Amazon! 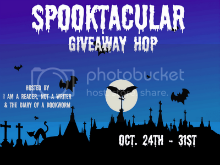 Spooktacular Giveaway! Win a $15 dollar Giftcard to Amazon! Spooktacular Giveaway! I will be purchasing the gift card through the US Amazon site- so if you are using that, you can enter! Now that you have entered my contest- feel free to hop along to the other giveaways!